On a visit to the Firth of Forth I went to Cramond Island. 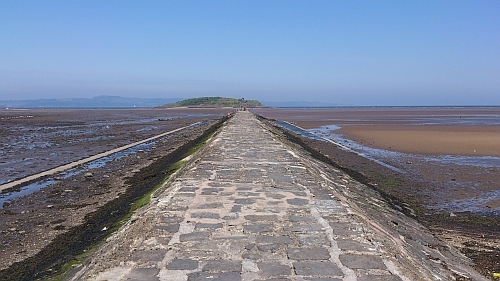 Cramond Island is one of a number of islands in the UK which can be accessed by a causeway during low tide. It is situated north-west of Edinburgh City. The causeway to Cramond Island is about 1 mile in length and takes a reasonably fit person about 20 minutes to walk to from the mainland. Before walking to the island, it is advisable to check the safe times for visiting. These are displayed at the start of the walkway and should be studied before walking over the causeway. The tide can come in at a fast rate, so ignoring the safe times can result in an extended stay on the island. The lifeboat at nearby South Queensferry spends much of its time rescuing people from the island. 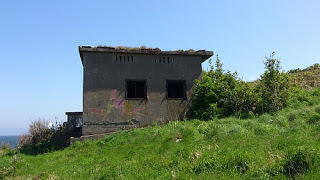 The island itself is quite small, being only 1/3 of a mile long and has the remains of buildings from the Second World War. 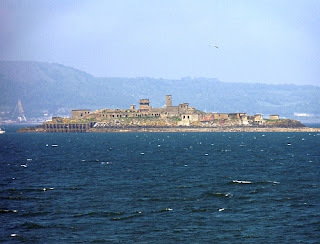 The Firth of Forth was the most heavily defended coastal area in Britain during the war. On the causeway there are concrete blocks which were installed in the Second World War to prevent attack from German U-boats. These can be seen in the photograph above. There are still many buildings remaining from the Second World War. These can be explored, as there are no doors or windows in them. The remains of the tarred roadway from the War is also still visible and a small landing platform could be seen on the north of the island. 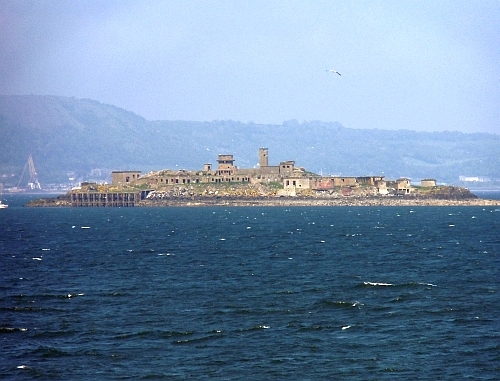 The island of Inchmickery can be seen in the distance. The island resembles a warship, due to the many buildings remaining from the World Wars. This island is now a Special Protection Area and home to a range of breeding seabirds including shag, eider and fulmar and puffins. The island was formerly a tern breeding colony and habitat management work is underway to restore nesting terns here. As the island is quite small, walking round it is not too strenuous. There are a few hills, but they are not very steep. The paths are well-defined and it would be difficult to get lost on the island. It is also a good place for a picnic, but drinking water needs to be taken as the island does not have a source of drinking water. We left the island at 15.00, giving enough time to get back to the mainland without getting caught by the incoming tide. The village of Cramond is very picturesque and includes a small harbour, a hotel and some old-fashioned inns. The author JK Rowling lives in the village. 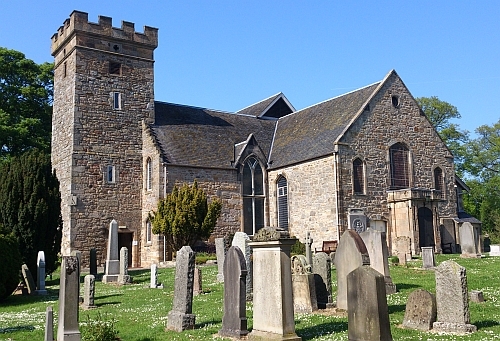 Cramond Kirk is build on the site of a Roman Fort from the time of Roman Emperor Septimius Severus in AD208. 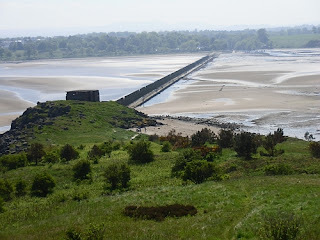 The Romans abandoned Cramond in AD212 and the settlement was then used by the locals. The oldest part of the kirk is the tower which dates from the 1400's. The kirk was rebuilt after the Reformation. The interior is superb, but unfortunately there was not enough time to investigate further. 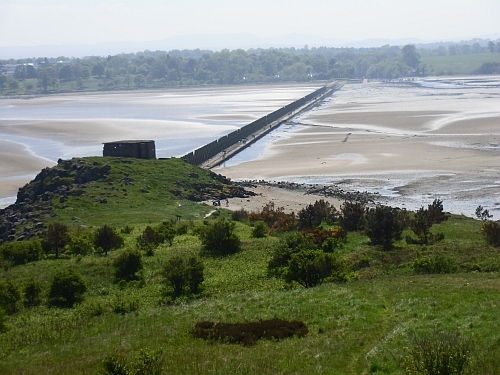 Cramond is situated north west of Edinburgh near South Queensferry. The times of the tides should be consulted before going to the island.